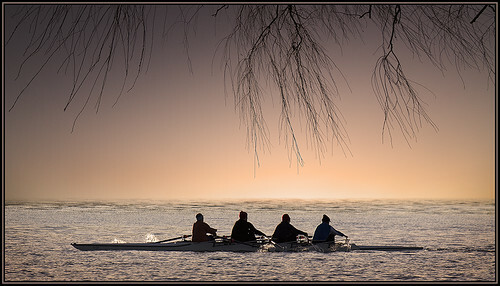 Grab an Oar…We Row Together! One of Greystone’s very wise and collaborative teachers, Joan Papp, wrote this message on a welcome card to a new staff member a few years back. It very clearly describes a core value that our school community is built on. No one at Greystone goes it alone! This sounds wonderful in theory, but in practice…it is hard work. Our grade level teams, along with the support of our educational assistants, our administration team, our front office team, are all expected to collaborate in order to provide our students with the best possible learning opportunities. The rationale: when colleagues come together to bring their best thinking to the team, the results can be extraordinary and all students benefit from the combined talents of the group. This is one of the most challenging parts of the work we do at Greystone, particularly when it comes to our teacher teams as we have a diverse group of strong individuals with excellent professional skills who demonstrate self-confidence and independence. How does a highly independent group of individuals establish themselves as an interdependent team; a team that sees themselves not as classroom teachers but as school teachers who have the best interests of ALL students at the centre of their work? Can they ever come together and work through common planning, common assessments and develop tasks designed to provide all students at a grade level with the best possible learning? Can they ever agree on how this should be done? Is everyone’s voice heard at the table and is everyone valued for what they bring to the group? Should they all be doing things identically in every classroom? Leave your ego at the door ~ critical feedback provided to team members about best practices for students is never intended to be a personal criticism towards a specific teacher…the conversation is about the work. Keep commitments ~ a team counts on each of its members to follow up on what they have agreed to during planning meetings. Engage in open, honest communication ~ teams need to address issues that come up when they come up and seek clarification to avoid misperceptions – again, not making anything personal but always making it about the work. Don’t die on every mountain ~ it is not possible to agree on everything…team members need to be flexible and recognize the importance of compromising on certain decisions. However, understanding who you are and what you stand for in relation to student learning is extremely important as these core principles are things you cannot compromise on. Be humble and recognize there are things you can learn from others ~ believe in the value that each member of the team can bring to the group and understand that together, each of you can learn and grow from something one of the members has brought forward to the team. Develop team norms ~ agree on how decisions will be made, how often and how long meetings will go for, decide on agenda items together and who will lead each meeting to ensure the group stays on track. Keep the main thing the main thing ~ all of the planning, ideas, brainstorming and feedback should be about doing what is best for students at Greystone. What one teacher thinks is best may be completely different from what another teacher thinks is best…the team moves forward most productively in making decisions if the team always revisits what the school’s vision is in meeting the needs of our learners. At Greystone, we have idenitified the inquiry rubric as the criteria for establishing the most meaningful learning for students – this rubric, which identifies key components of deep meaningful learning, should be at the centre of the team’s collaborative work. Be patient ~ coming together as a team takes time and often a lot of energy. Not everything needs to be the same ~ teamwork does not mean a teacher has to replicate what goes on in another classroom. Each teacher creates a unique learning community in his or her classroom and it is completely individual to the specific qualities and characteristics of the teacher, the students and the dynamic learning process. Teachers must always be responsive to the specific learning needs of their own students. Celebrate successes of the team ~ focus not only on things which need to be improved upon, but collect evidence of success to share with the team and celebrate the accomplishments of each teacher, each classroom and each student…recognize these achievements are the result of the team’s effort. We do give up some things when we decide not to go it alone anymore. The most important thing we give up is believing that as individuals, each of us alone has all the answers and has got it all figured out. Once individuals can let go of this idea, they will find the experience of teamwork rewarding. In fact, many of our teachers are saying that they would never teach any other way as the support and sharing of ideas is energizing and leads to better learning for kids. In addition, recognizing that you are never alone in anything you want to explore with colleagues and students leads to greater growth, innovation and creativity for our teachers…and for our students. Isn’t that what we want for our schools? Grab an oar! 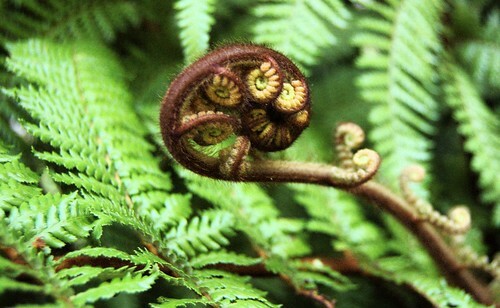 The unfurling New Zealand fern frond, the Koru, represents new life, growth, peace and harmony. I am a bit of a “Hector the Collector” of quotes. I keep them filed away, either on bits of paper tacked to my bulletin board, in folded over pages of books, in a file folder or even locked away in the old memory bank. They serve as reminders for how to live my life aligned with things that are important to me both personally and professionally. When Teachers Stop Growing, So Do Their Students is a quote that I can still remember from a presentation in University. This message has as much meaning now, 28 years later, as it did on the day I shared it with my pre-service classmates, when the whole world of teaching was just about to open up for me. As teachers, we are in the learning business and we are always learners ourselves. We often do not have enough hours in the day to engage in deep meaningful learning with our colleagues as often as we would like; however, when we do set aside time, it makes us far better teachers and creates far more success in our classrooms and schools. One of the regularly scheduled times that we set aside for deep, reflective learning at Greystone is during our Professional Development Days. Our Professional Development Days are an excellent opportunity to reconnect with our school’s vision and reflect on our professional practice, in the company of our peers, in order to learn and grow together. We viewed a webinar on Inquiry from Neil Stephenson at the Calgary Science School. Neil ‘s webinar included an excellent clip from High Tech High. – What stands out for me in this clip? – What challenges my thinking? We know you are a good teacher by the sophistication of your kids’ work. If your kids are producing work that is worth doing and has lasting value and learning that is worth learning, then you’re a good teacher. – Do you agree or disagree with the definition of a good teacher? Why? We spent time with our “Critical Friends” on staff talking about our reflections and sharing our classroom practice for feedback from colleagues. We skyped with Neil, from the Calgary Science School, to discuss ideas around what makes a learning task authentic and purposeful as opposed to simply something fun for kids. We used an example from the book “Making Learning Whole” by David Perkins to illustrate this point. It was an excellent discussion as teachers, in groups, needed to examine two highly engaging tasks, in order to decide which one had the most rigor and utilized higher level thinking. One of our teachers, Jessie Krefting, introduced us to googledocs and teachers practiced using this tool to record and share feedback based on information presented to them from our team of teachers working on Parkland School Division’s Comprehensive Reporting Project. One of our teachers, Craig Letendre, shared the student blogs he has been developing with his class. He shared his most recent “aha” moment when he described to all of us how the feedback students are providing to each other through the comment section is proving to be highly motivating to his students in their growth. He is exploring how to further develop student skills in providing each other with feedback by using criteria from the projects as a starting point for comments. He is also establishing criteria for what would make a project or assignment “blogworthy”. The highlight from Craig’s sharing was the interest sparked among our teachers in developing this as a tool for ongoing feedback for growth with students AND communication between home and school (possibly replacing report cards throughout the year?!) The challenge…we need MORE TECHNOLOGY in the hands of our students! I challenged the teachers to continue to obtain feedback from multiple sources to provide them with opportunities to reflect and learn. Since our student led conferences were right around the corner, I asked teachers to consider how they would obtain feedback from parents to assist them in their professional growth. Several teachers amazed me with the thoughtful questions they created and with the input they have requested from parents – this is an example of our teachers’ dedication to learning and it speaks volumes about the highly professional qualities our teachers possess. In grade level learning community teams, teachers collaborated to plan and organize their student-led conferences. We have tried a variety of formats for conferences every year. We listened to our parent community when members of our School Council told us that as much as they appreciate seeing student work, they still want to have individual time with their child’s teacher(s). This year, many of our teachers provided students with their report card information prior to conferences and rehearsed with them how they would share their learning with parents. Students showed evidence of learning which demonstrated their level of understanding of the outcomes. The parents received their report cards at our student led conferences and it was used as a tool to guide students in the conversations about their learning that they had with parents. We know we haven’t “arrived” yet in creating the best possible student led conference structure and we will always be growing with this as we continue to gather feedback and reflect on how to best use conference time as an opportunity to make our parents partners in learning. The only thing that could be improved on in the area of our teachers growing and learning together? We need more time for this more often!!!! Great things continue to happen for kids when everyone in a school is committed to always growing and growing all ways. · Evidence of Learning – How do you know they know? · How is technology being used to “transform” learning? Planning collaboratively takes time to discuss “best practices” to create enduring learning tasks with assessment embedded throughout. Recently grade level teaching teams participated in a “think tank” via Skype and / or Video Conferencing at our school and Parkland School Division with a trusted colleague and expert from the Galileo Educational Network in Calgary ~ Candace Saar. Our grade 5 Learning Community is currently working on creating coffee table books about “stories” of Spruce Grove ~ “The ABCs of Spruce Grove”. Students will be creating a virtual book using digital cameras and IPOD voice recordings capturing why people choose to live in Spruce Grove. Through their work students will share positive things about the community; inform others of the communities’ history and present by conducting interviews, looking for representative and powerful community images and writing detailed and engaging stories. In grade 6 students will be exploring different perspectives of an individual’s voice being heard by examining the decision process in Canada, specifically Spruce Grove, Alberta, Ancient Athens, the Iroquois, and Egypt. Students will develop an understanding of the past and present by being able to make connections through their work. Learning will be represented by the students working collaboratively to create a script for each group. Information will be gathered by peer interviews using IPOD voice recording, expert and community interviews videotaped by the students, and by examining stories from the past and present to build upon each perspective. Students look forward to sharing their final product by sharing LC 6 Historica Minutes. Learning Community 7 has been actively out and about in the community conducting interviews at various businesses including Jack’s Drive In, Sandyview Farms, Horizon Stage and at several local community venues; the Tri Leisure Centre, Spruce Grove Library and Agrena as well as with local celebrities and public figures including Mayor Stewart Houston. During the interviews information is captured using IPOD voice recordings and by video tape. Students have been taking a close look at their footage to pull out the interest “stories” they are planning share on their culminating video. Much planning and time goes into the students developing strong interview questions, making contact with the community, and examining meaningful information and stories they wish to share. In Learning Community 8 the teachers are currently laying the foundation for students to work with the elderly in our community to establish and share worldviews. Students will look forward to visiting Seniors Homes, inviting guests into our school and connecting with their own families to carry out interviews to gather these perspectives and stories.Students will also explore what their own worldview is in order to be able to compare and contrast with our participants’ worldview. Students are planning to showcase the worldviews of the Spruce Grove Community through and interactive documentary. Stay tuned for “evidence” throughout the duration of these Community Projects. Two of our teachers on the grade 6 Learning Community team ~ Jessie Krefting and Michelle Kershaw, had the opportunity to attend a conference ~ Inclusion: Multiple Lenses with two Parkland School Division representatives, Emilie Keane, Acting Assistant Superintendent and Nicole Lakusta, Learning Technology Facilitator on March 1 and 2 at the Fantasyland Hotel. Guest speakers Alex Dunn, along with Kathy Howery, Educational Consultant Doctoral student at the University of Alberta, presented on supporting inclusion in Alberta through the use of Smartboard and other Assistive Technology in classrooms. * I feel that our math class went really well today. It feels like we went more smoothly than any other day. Using Pictochat would be helpful instead of leaving the person that you were helping. * I feel good about today’s math lesson because we learned that we could use electronics for questions. We could use it by asking questions, and give someone an answer to THEIR question. * I like that we are trying to incorporate technology into our math. The math seemed to move faster than usual. I see that Pictochat has helped because there was less noise and people could work at their own pace. If there was a question it was easier to ask plus if the question was already asked you could look back. * Today I feel that math class was a lot funner and I learned a lot from this lesson. Using Pictochat helps and probably others by asking questions, learning a different way, etc. * I think the math group went really well I like how we get to use the DS’s. I think the Pictochat is really useful. It would be nice if the school could have DS’s. We are exploring the use of IPODs in the classroom as a home school communication tool by utilizing the voice recording and calendar application. In addition students are accessing Vocaroo to capture learning as it happens so it can be shared with their parents and teachers. We are finding this to be an excellent strategy for students who experience challenges with written expression. As we continue to move forward in creating meaningful, real life learning experiences for our students we look forward to sharing how 21st century learning and technology will continue to drive and support our practice. It is important for us as educators and adults in the lives of our students to be responsive to their needs and the “technologically” evolving society in which we live. Playing the Whole Game – IN EXILE! Bringing disconnected bits and pieces of knowledge together for students into a whole, meaningful, deeper understanding of a topic is what we continue to work on as we engage students in learning at Greystone through our focus on Inquiry. David Perkins uses the game of baseball as a metaphor for illustrating how teaching through inquiry in any subject at any grade level can be made more effective if students are introduced to the “whole game”, rather than isolated pieces of a discipline in his book Making Learning Whole. A few of our teachers are currently participating in a book study, using Perkins book, through Neil Stephenson from the Calgary Science School. This book is helping us to deepen our understanding of Inquiry by reminding us that playing the whole game gets students engaged in understanding the bigger picture of learning related to a particular outcome. It provides students with a framework so that they are able to connect the dots and make meaning of the topic of study and how that topic lives in the real world. This past week, our Learning Community 9 students were engaged in playing the whole game of learning in Social Studies. Grade 9 students are just beginning to develop their understanding of immigration. Part of their learning requires that they understand multiple perspectives of immigration, including the perspective of refugees. Developing this deeper understanding of perspective is intended to help them learn how Canada’s policies respond to the needs of refugees in light of world issues. Why do we care? Why do we let these people into Canada? How do economic, political, security and health factors play into the development of our policies? How do you think it would feel to be separated from your family? Frightening, in several different aspects. The person I depended to help me through everything is no longer with me. I’m alone to face everything by myself. Also, added to the already stressful life, it would be scary to wonder if my husband and children are still alive. If my husband gets in trouble with the government, my family and children must pay. We are forever associated with him and if he’s a menace to society, so are we. This affects where we can go, our food, and how we’re viewed. 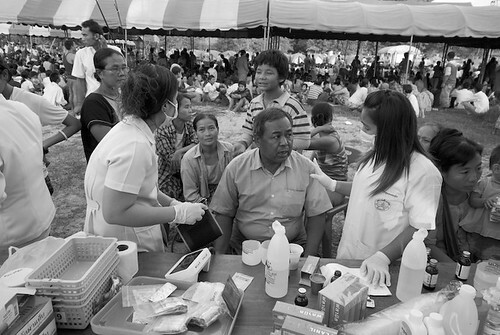 What is the hardest aspect of what you have had to endure in this refugee simulation? Dealing with the loss would be the hardest aspect. Adding all those supressed emotions to dealing with little kids, and trying to stay alive and well, in a refugee camp, would be difficult. I’m sure I will never see my husband and son again. We have been transported so far away from them and into our asylum country. If they’re alive, I imagine they are ill or near death and will never find us. I feel they are probably perished from the dangers our home country possesses. What were some of the challenges your family faced? I could lose my children in all the confusion, if rations tables are like they were I wouldn’t be able to get food if I had no male person traveling with me. Discrimination because of gender. Getting sick because I’m slightly older and might be more prone to disease. The challenges my family faced were devastating. We weren’t allowed to receive food or water without my twelve year old son present, since females weren’t allowed. My family separated many times during the ordeal and my eight year old daughter became ridden with disease. I couldn’t understand anything anyone was saying, none of us spoke their language. It was an extremely stressful, confusing and horrifying experience. I’m hoping our asylum country is worth it.